This article by Harry Leslie Smith originally appeared in the Mirror. More than 90,000 people marched this weekend to tell the Government: “Britain needs a pay rise”. Everyone from young children to pensioners, public sector workers to celebrities took to the streets of London to protest at the TUC-organised demonstration. 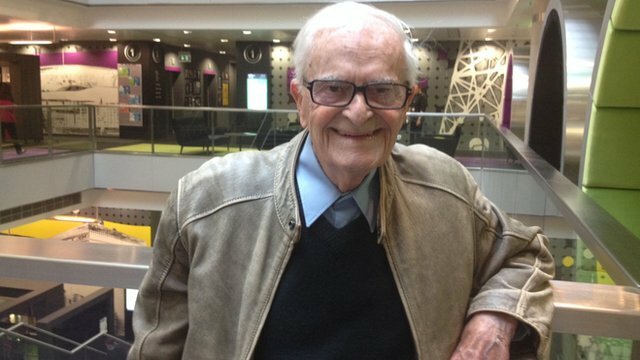 Among the inspiring speakers was war veteran Harry Leslie Smith who spoke up movingly for the NHS at the Labour Party Conference. I am writing this as I prepare to leave the capital to return to the north. Outside of my hotel window I see London, like the rest of our country, can’t even rest on the 7th day. Not one corner of our island is quiet because, after four long years of Cameron’s coalition government, we must work every waking hour to stretch pennies into pounds to meet the rising cost of living. Austerity has ground the British economy into one that profits the elite at the expense of everyone else who toils on zero-hour contracts or tries to live off of stagnant wages. For many, these are grim and pessimistic days that are made more dismal by the exorbitant cost of higher education, housing, fuel and food. Life hasn’t been this difficult since the days of my youth in the 1930s and so, despite the fact that I am in my golden years, I can feel empathy and much concern for the future of today’s young. But I am not too discouraged by the horrendous cost austerity has exacted on Britain. I find that there is much reason to hope that soon our country will return to its standard of fair play for all. I take heart in demonstrations like the TUC’s “Britain needs a pay rise” that was held in Hyde Park on Saturday. Despite the fact that I am in my 90s and have been retired from the working world for close to 30 years I walked with thousands of others because I know what it is like to be paid an unfair wage. But I was encouraged by what I heard and saw throughout the day. People who turned up weren’t radicals, agitators or malcontents but ­ordinary folk from all walks of life and ­professions who wanted to raise their collective voice to fight the ­injustice. The young, middle aged and soon-to-be retired were all equally represented and they all believed they were not only marching for themselves but for every worker who is struggling to live from pay cheque to pay cheque. As I broke bread with these strangers – who all shared one noble ambition to receive just compensation for their labours – I was struck by their ­optimism and resilience. All knew this battle for fair wages begins and ends with the workers who must mobilise either through their unions or through collective action. It must be done as one young man said to me, like the great civil rights movements of days gone by, through peaceful protests against corporations who dole out profits to their shareholders but refuse to invest their wealth back into Britain by paying proper taxes and wages. Protesters are rightfully confident their actions on Saturday and in the ensuing months will bring change for the better to British workers’ wages. For me I don’t doubt their perseverance and optimism will prevail and soon we will see changes for the better to the lives of British workers. Keep your mitts off my NHS! The very wonderful Harry Leslie Smith, speaking that the 2014 Labour Party Conference. Comments Off on Keep your mitts off my NHS!